By now the city of Ghirapur and its residents had become acclimated to the presence of the enormous beetle-like inquirium. The sprawling, sophisticated research facility sat with its six long, metal legs tucked under its body in the corner of Ghirapur's central square. Whereas before traffic would slow to a standstill while drivers gawked open-mouthed at its gleaming, bulbous metal protrusions and aether-measuring antenna, now commuters sped by barely even noticing its presence. The inquirium had been stationary for so long that a family of peafowl had taken up residence, nesting in a groove in the segment that most resembled the beetle's head. Even when, once every hour or so, a sizzling sputter rose from the bowels of the laboratory, issuing an array of crackling sparks through the exhaust tower, the birds didn't so much as stir. Life had adapted; Ghirapur had claimed the inquirium as part of its identity like so many of its other eclectic landmarks. Hardly anyone stopped to wonder anymore about the brilliant researcher who lived inside. Rashmi had all but forgotten them as well. She had all but forgotten everything except the device she was designing. Just a few months ago, the subject of matter transportation had become a hot topic within the usually subdued aetherologist societies. Within the small inventor circle, it had gone from a theory that people only whispered about to an obsession. But only Rashmi had a device capable of powering such a venture. Her groundbreaking aether condenser, which had gone nearly unnoticed when she first introduced it, would now be thrust into the spotlight as the centerpiece of the transporter. It was as though the condenser was made for this very application, as though she, Rashmi, was made for this very experiment. The aether patterns were aligned, they were pulling things into place, rushing with unstoppable momentum toward the crescendo. She would do it. She would complete the device, just in time for the Fair, just in time to prove to the world what was possible. "Tweezer." Rashmi held out her hand. "Tweezer." Her vedalken assistant, Mitul, placed the tool on her palm. She twisted a fine piece of wire into place, listening to the pattern of aether as she worked. Knowing the aether allowed her to tighten the wire just enough to secure it without causing strain on the metal. "Calipers." Mitul traded the tweezer for calipers. "Mark at 3.084." Rashmi made the mark. "We're definitely pushing the upper limit with this." "It can handle it. I performed the calculation. Thrice." Mitul took the calipers and gave her an optical center punch. She punched a hole in the golden metal piping and, with the care of a surgeon, inserted the new filament, connecting it to the rest of the aether-circuitry. "That should do it." Rashmi stood up, stretching her cramped neck, a surge of nervous thrill running through her. Although they had performed hundreds of trials, she still felt a rush each time they were ready for another; any one might be the trial that proved their theory. Especially now, with the Fair so close. "I will set up." Moving with a poise that Rashmi envied, Mitul strode to a pot that sat in the sunlight that streamed down from the dome window above. He plucked a living flower from the pot and deposited it in a waiting vase on the table in the center of the room. "Test subject number 848 ready." Mitul stepped back. Rashmi tried not to think of the other flowers that had come before 848. She hefted the transporter off the workbench and carried it to the test area. It was in the shape of a large gold hoop, about as big around as the wheel of a Consulate cruiser. 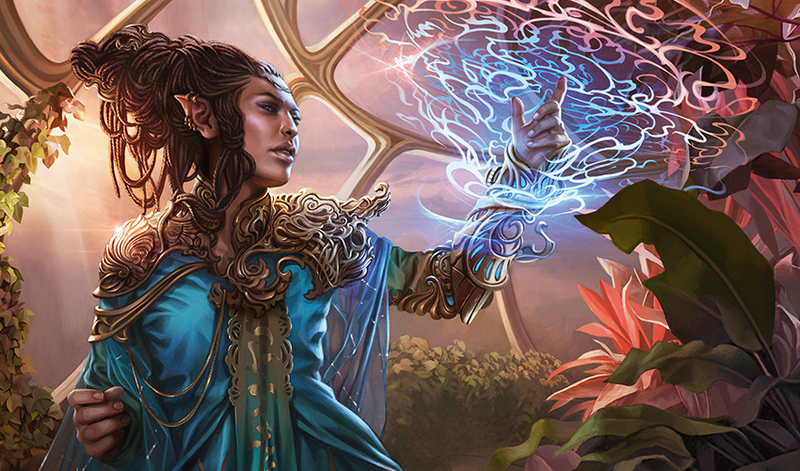 Holding it above the top of the flower, Rashmi slid a golden filigree switch to activate the aether valve. Vibrations echoed from within as glowing blue aether rushed through the ring. She opened herself to the Conduit, willing her other senses to dull so she could see the aether. The pattern it made as it flowed through the transporter was exquisite. The tweaks to the design had altered the flow just enough to add a repeating flourish at intervals around the ring, one that reminded her of a bandar's tail. She took this as a good sign; some elves considered bandars to be good luck. "I think this might be it, Mitul," she whispered. "I can feel it in the aether." Her hands were trembling. "According to my calculations, this iteration does seem promising." Mitul's expression didn't change, his manner remaining, as always, professional. Unlike her, he never seemed nervous or excited before a trial; he was a constant, steady force in the laboratory, always focused. Mitul nodded. He was standing at a tall desk arrayed with aether measuring equipment, his pencil poised over his laboratory journal. "I am prepared." You can do it, Rashmi silently encouraged test subject 848. "All right, I'll be releasing the transporter in three...two...one..." She let go of the ring, and in response, the aether within swelled, buoying it up so it hovered in place just above the flower. "Trial start time captured." Mitul was scribbling away. "Initial aether measurements recorded." With a soft exhale, the ring began its descent, floating toward the petals of the flower. Rashmi's nerves were swallowed by the hum of aether. She was unable to look away from its pulsing flow that evolved as the transporter moved closer and closer to 848. The cadence picked up with every passing heartbeat until it surpassed the confines of its own structure and began to shift. Rashmi could see the usually gentle bends skipping and taking sharp turns; the flourishing bandar tails were coiling around each other. She recognized this behavior. The aether was forming the patterns that promised to defy the laws of the world. When the ring became level with the flower petals, she heard Mitul's voice as though from a great distance. "Time of contact marked." The tips of the petals flickered as the ring passed over them. The golden transporter continued to descend. And then suddenly the structural integrity of the whole flower gave way, and with a soft pop the entire flower imploded into a lingering outline of dust. A breath later the outline erupted, bursting apart, each little piece of matter zipping outward with extreme speed. The miniature projectiles shot into the ring, pitting the metal, and in some cases slicing right through. The transporter sparked and crackled, the delicate aether filament squealing and then burning out before Rashmi could lift it up and away. "Trial failed. Test subject 848 disintegrated," Mitul said. Rashmi sighed, running her fingers along the metal of the transporter, assessing the damage. She had really thought this time it was going to work. "Of note," Mitul went on, "measurements detected traces of transmuted matter, indicating that 848 responded well to the initial phase of contact." "Transmutations in preparation for transport?" Rashmi's shoulders straightened and her spirits lifted. "It would appear so, yes." "Well then, if that's the case we merely have to provide a more stable environment." "My thoughts precisely," Mitul said. "I find myself inclined to suggest that we run our next trial with a less turbulent stream of aether. If we increase the diameter of the piping—"
"We'll reduce the turbulence of the initial flow, and decrease the volatility!" Rashmi finished for him. "Mitul, that's brilliant!" "I believe the hypothesis is quite promising, yes." This was exactly why they worked so well together. Neither of them was ever discouraged for long. Rashmi had the Great Conduit to remind her that she was on the right path, and Mitul had his belief in the iterative method of research. Though he never questioned her relationship to the Great Conduit, Rashmi had a feeling Mitul didn't put much stock in it. She assumed that, like most vedalken she knew, he subscribed to the unending process of working successively closer to a solution by repeating the previous method with a slight variation. Though she didn't quite understand how someone could find inspiration through that kind of iteration, she never questioned him. It didn't bother her that their philosophy was different; the reason for their motivation didn't matter. It was their optimistic spirit and commitment to their research that bound them. And not a day went by that Rashmi didn't feel fortunate to have found such a gifted research partner and friend in Mitul. The vedalken looked up from consulting his log book. "As it happens, we have just the piping in the storage room. I'll retrieve it and return shortly." He was halfway across the room before he finished talking. And for her part, Rashmi was already elbow-deep in the ring of the transporter working on repairs. They were past time for trifling. Though Rashmi tried to ignore its distracting presence, she knew that the circled date on the calendar was rapidly approaching. The Inventors' Fair qualifiers were less than a week away. The Fair was her chance to show the transporter to the world, but more importantly to the judges and benefactors. She would win, of that she was certain, and then she would have patrons and sponsors for her research. She would have the support of the Consulate instead of a dwindling aether supply. Maybe she would even have her own automaton workforce to fill the inquirium. But that was getting ahead of things. It was time for test subject number 849. "Test subject number 887 ready." Mitul's voice was hoarse; neither he nor Rashmi had slept in two days. It was the afternoon of Inventors' Fair qualifiers, and they had not yet run a successful trial. This was their last chance. If this trial proved a success, they would have just enough time to package the ring, load it onto a cart, and make their way to the arena in time for their qualifier. If this trial was a failure, it was over. Rashmi held the ring over the slightly wilted flower. Her arms trembled, not from excitement, but from fatigue. Why had the Conduit brought her to this point if it didn't mean for her to win the Fair? Why had it pushed her toward this just for her to fail? She wanted to scream. But she didn't. At that moment she saw Mitul stifle a yawn, and it stirred something inside her. She couldn't give up, not yet. There's still one more chance, she reminded herself. She made an attempt to clear her mind of cynical thoughts. She told herself that maybe she and Mitul were meant to struggle right up until the last moment. Maybe this was all part of the pattern the Great Conduit was weaving. Maybe this would be their moment. "All right, here we go," she said, with as much oomph as she could muster. "In three...two...one..." She let go of the ring. "Trial start time captured." Mitul made a mark in the journal. "And measurements recorded." He rubbed his reddened eyes. Rashmi tried to assume the role of an objective observer, but as the ring dipped toward the drooping petals of the flower, she found herself once again holding her breath and hoping. It had to work this time, it just had to. The ring passed over the topmost petal. "Time of contact marked," Mitul said. The petal flickered. Don't implode. Don't implode, Rashmi pleaded. Rashmi's insides froze. No. The ring crackled and sparked. No. She heard the filament give way and snap. No! This wasn't what was supposed to happen. This couldn't be. "Trail failed. Test subject 887 disintegrated," Mitul said. Rashmi didn't even bother to try to lift the ring up and off the exploding remains of the flower. There was no point salvaging it—it was over. She turned away, unable to watch any more. Vaguely, she heard the ring clatter on the tabletop, the sound ringing in her head like the final bell at academy. The test was over and she had failed. "Addendum: in the time succeeding the recorded completion of the trial involving test subject 887, continued observation reveals that there appears to be a difference in the way organic and inorganic matter are affected by the aetheric waves of space." Mitul's voice washed over Rashmi like water over an exposed wound. "Mitul, there's no point in recording anymore." She glanced at the red overdue notices on the far desk. "I should have told you long ago. I'm so sorry, but the inquirium is—"
"Rashmi," Mitul interrupted. It was odd to hear him use her name; he rarely addressed her. "Rashmi." Something in his voice made her turn. "L-look." He was pointing to the corner of the laboratory, his eyes blinking rapidly. Rashmi followed his finger. There, leaning against the wall inside a small inscribed circle, was the vase. Rashmi gasped. She looked back to the table in the center of the room; only the ring rested there. Her first thought was that it was a trick of the eye. It could be a different vase. But there was no mistaking it; it was the only vase in the whole laboratory. It had passed two iron barriers, a stack of equipment, and Mitul himself, and now it rested gently against the wall, neatly inside the circle intended for the flower. Rashmi laughed. It was an odd-sounding laugh that snuck up on her. She might have kept laughing, except her heart leapt up into her throat, nearly choking her. She couldn't manage even one full sentence. "Mitul—Mitul—w-we—"
"Yes." Mitul was still blinking rapidly. "We successfully transported inorganic matter across space." "Ha! We did it!" Heat and moisture pressed against the back of Rashmi's eyes and she ran to her friend, throwing her arms around the tall vedalken's neck. She squeezed. "We really did it." "As a matter of fact, we did," Mitul said, extricating himself from her hug. "Now, I must focus on recording these results. I cannot allow myself to get swept up in potentially distracting emotions when there is science at hand." Rashmi laughed again; it seemed the only reaction she was capable of at the moment. "But do not mistake this for lack of excitement." Mitul offered the smallest of smiles, the slight upturn of the corners of his mouth. "I am quite excited. Oh yes, quite." But he gathered himself, put pencil to paper, and cleared his throat. "Now, here we go: with regard to the most recent trial, it appears the feedback we were observing was generated by the interaction between organic matter and transdimensional space. We iterated upon our design, but we never changed the nature of our test subject." Mitul's focus on the facts seemed to have given him back control of his eyelids. And the reassuring and familiar sound of his voice returned Rashmi to herself as well. "The Fair!" she cried. Mitul's focus was uninterrupted. "I will now proceed to document all observable features of the vase to ensure transport was comp—"
"No, Mitul, there's no time!" Rashmi grabbed the transporter off the table. "We have to get to the Fair, to our qualifier!" "Oh!" Mitul turned, his eyes lighting up. "Oh, yes, you're quite right." He nearly dropped his journal. "I'm experiencing such a rush of adrenaline that I'm barely thinking. I shall conclude documentation when we return. If we pack up now, we should have just enough time to crate the device in the appropriate safety packaging, load it onto the cart, and wheel it through the grounds, which are sure to be crowded and require a reduced speed of transport, for an arrival time at the arena the requested one hour before our scheduled qualifying demonstration." "Perfect." Rashmi was inspecting the ring. "But we'll need a new filament first. This one's shot." "It must be due to initial contact with organic matter," Mitul said. "I predict that we won't see that behavior when we transport only inorganic matter." "Let's hope not." Rashmi was at the workbench peeling back the filigree to access the filament. "I'd rather not entertain the judges with a fireworks display." "No, I don't suspect that would be well received." Rashmi swore she heard Mitul chuckle as he darted off toward the storage room. Rashmi ran her fingers over the filigree. There were a few dents and scratches, but nothing that should interfere with the functionality. The functionality that moved matter across the room! "We actually did it," Rashmi whispered. She glanced over her shoulder at the vase. Part of her didn't believe it was really there, but it was. "I should never have doubted." She closed her eyes. There was the Great Conduit, shining brilliantly in front of her. Its warmth enveloped her. She reached for it. "We do not have another filament." At the sound of Mitul's voice, Rashmi's eyes shot open. He was stutter-stepping into the room. "We're out. I knew our supply was dwindling. I should have—but there was no time to order. The iterations kept coming. But that is no excuse—this responsibility falls to me. I don't expect that you would be able to forgive my mistake." His twelve fingers were fluttering around his long blue face. "Mitul, it's all right." Rashmi put her hand on his shoulder. She felt oddly calm. She could feel the guidance of the Conduit, and she knew exactly what they should do. "Crate the device," she said. "We'll take it to the market, get a filament there, and then head back to the Fair. We should still get to the arena in time for our qualifier." "Oh." Mitul blinked. "Oh, yes." He let out a long breath. "That might very well work." "It will," Rashmi said. "This is our moment." Rashmi shielded her eyes against the brightness. Everything shone in the light of the waning sun: the polished metal automatons, the gleaming architecture, and the streaming banners, ribbons, and festoons that covered the square. 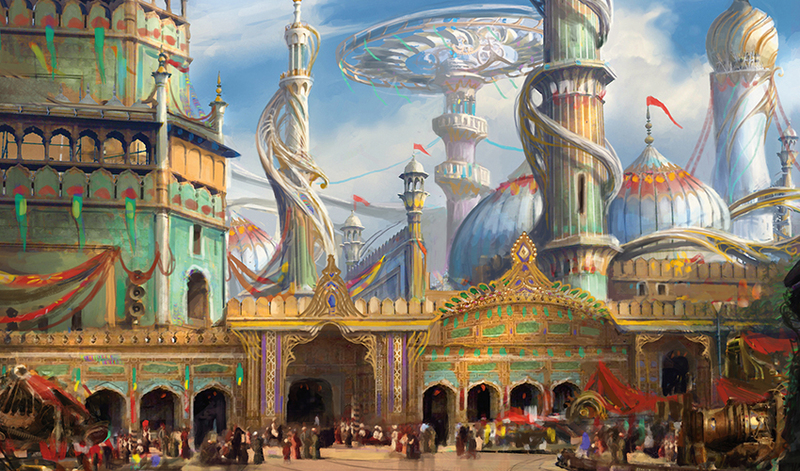 The Inventors' Fair had been built up around the inquirium while they had worked inside these past months, oblivious to all of it. It was as though Rashmi had retreated into her laboratory on one world and exited in another, one that was a giant labyrinth of glistening metal and celebration. But there wasn't time for any of that now. The Conduit was tugging on her with urgency. "This way," she said to Mitul, pointing to the enormous peacock feathers in the distance that marked the entrance to the market. But before she could take a step, an automaton rolled up into her path. "Welcome to the Inventors' Fair!" it said jubilantly. "The intersection of creativity and genius." She turned away to sidestep it, wheeling the cart with the transporter around, but just then a second rolled up. "Don't miss the dragster propulsion races at Ovalchase! Get your tickets now." Rashmi backed away, looking for an out. "Visit the one-hundred-acre zoo! Animal constructs abound!" "Perhaps we can find an alternative path through over here." Mitul led the way and Rashmi followed, but so did a handful of automatons. "Marvel at the living cogwork architecture designed by some of Ghirapur's most storied metalworkers. Isn't it amazing?" "Yes, yes." Mitul waved the automaton off. "We're in a bit of a hurry, you see." It wasn't discouraged. "Are automaton showdowns more your style?" "No. If you'll pardon me..."
The automaton refused to let Mitul pass. "Please remember that gremlins are not permitted on the fairgrounds." "Of course not, that would be absurd. Now, I must insist—"
"Refrain from carrying in outside aether canisters. And if you witness any suspicious activity please report it to the nearest Honorable Guard or Autom—"
"If you please, get out of our way!" Mitul stiff-armed the automaton. "There." He beckoned Rashmi. "I believe we can now reach the market." Rashmi hastened to push the cart past the reeling automaton that was telling them to enjoy their time at the Inventors' Fair. She had never seen Mitul so forceful before. She glanced back at him, scrutinizing for a moment; was it possible that he was feeling the tug of the Conduit too? Perhaps someday she could yet convince him that there were forces that his analytical view couldn't explain. Together they picked up the pace, jogging toward the golden filigreed marketplace. The sun was dipping low, just under the massive feathers of the market gate, as they raced down Ninth Bridge and hurtled into Remi's shop. The interlocking gears on the door squealed and jangled as Rashmi pushed the cart through. The scents of polished metal, sweet rust, and biting grease greeted them—usually a bouquet that would calm Rashmi's nerves, but now it only served to heighten her sense of urgency. She fished the broken filament out of her pocket. "We're looking for the WP series," she said to Mitul. They both knew exactly where to look. The back wall with the perfectly organized and color-coded cubbies. They had purchased most of their supplies at Remi's; he had the best prices and let them stay to watch the underground automaton battles. "Should be right..." Mitul pulled out a green cubby. "Here." Rashmi panicked, but only for a moment. "I'm sure he has some in the back. Remi!" she called, catching sight of the tall blue shopkeeper between the shelves. "Is that? Do I hear...? Rashmi! Mitul! It's been ages!" A grease-stained Remi made his way across the shop, wiping his hands on a rag. He tossed the rag over his shoulder before embracing Rashmi. "Are you here to—"
"We need a filament," Rashmi cut him off. "WP series." Mitul was holding the empty cubby. "Huh?" Remi looked at the cubby. "Out of that one too? These inventors are worse than gremlins, they're going to run me out of house and home." "You must have some in the back," Rashmi said, struggling to keep her sense of rising dread in check. "Afraid not, friend." Remi shook his head. "The back's as cleared-out as the storefront. It's been an endless stampede since the first train arrived from Peema. You'd think we were under attack. Everyone needs a spare this, or a replacement that. I won't be able to restock until the shipment from Lathnu." "Oh, round about three days from now." The last of Rashmi's decorum shattered. "No, no, no. Remi, we need the filament now. Please, you have to have something." "Wish I did. You know you two are my favorite inventors." They wouldn't be inventors for much longer if they didn't get a filament. Images of overdue notices swam in Rashmi's mind. Her palms began to sweat. Suddenly the shop seemed too small. "Ah, well then we must do the next logical thing." Mitul's voice was steady but his twelve long fingers fumbled to push the empty cubby back in place. "We must check the other shops." "The other shops." Rashmi swallowed her mounting hysteria, but barely. "That's logical. Yes." "From what I hear, everyone's dry as an empty aether canister," Remi tutted. But Rashmi was already halfway down the aisle, pushing the cart. She hurried out the door and wheeled straight into the next shop on the bridge. She would check them all if she had to. "Wish I could be more helpful, but..."
"You, know, you're the second person to ask for a WP series today..."
"It's just been such a mad rush..."
It seemed that there wasn't a WP series filament in all of Ghirapur. Exhaustion settled in, and Rashmi collapsed against the railing of the bridge. Mitul walked over from the shops on the other side, his eyes downcast. He exhaled. "It is my fault." It wasn't, but Rashmi couldn't bring herself to say otherwise. Not right now. She brushed her long hair off her neck as she watched the sun sink below the water in the distance. Their demonstration would be starting any moment, and they would miss it. It seemed impossible that they should be here with the transporter now, so close, yet without the means to complete it. She was no longer panicked, no longer angry, she was only heartbroken. 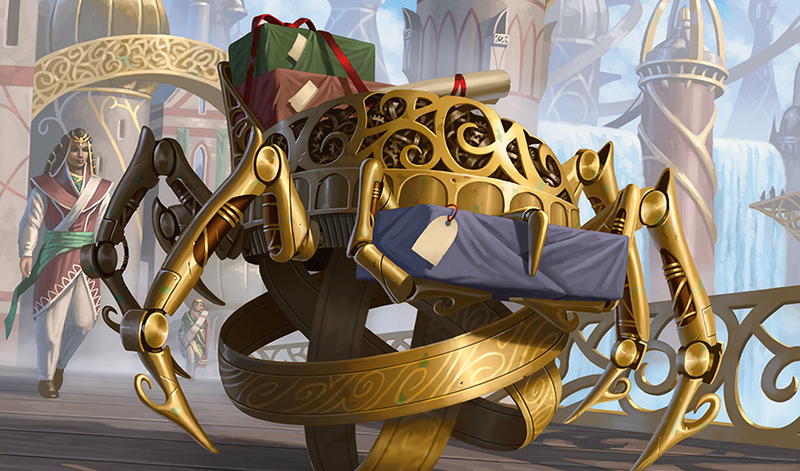 It was more than just the matter transporter; it was the inquirium too. Without the patrons and sponsors she had counted on from the Inventors' Fair, they would lose everything. It was time to tell Mitul. Rashmi's stomach grew tight. She found herself staring directly at a passing mail courier automaton so she wouldn't have to look at her friend. "Mitul, we're going to have to close down the inquirium. We're out of time. It's my fault. I put everything we had into this project and now—" Her voice hitched, she couldn't finish. "I'm so sorry. Working with you these past years has been a true honor." Before he had a chance to respond, she took hold of the handle of the cart and walked away, striding down the bridge toward the sunset. The inquirium wasn't where Rashmi wanted to be right now, but she didn't want to be anywhere else in the city either. The thrum of excitement and rush of celebration outside was too much. She dragged the crate up the steps and unlocked the door. She should get to packing; there was no point in delaying. "So you are alive!" The sound of her friend's voice nearly knocked Rashmi back down the stairs. "Saheeli?" 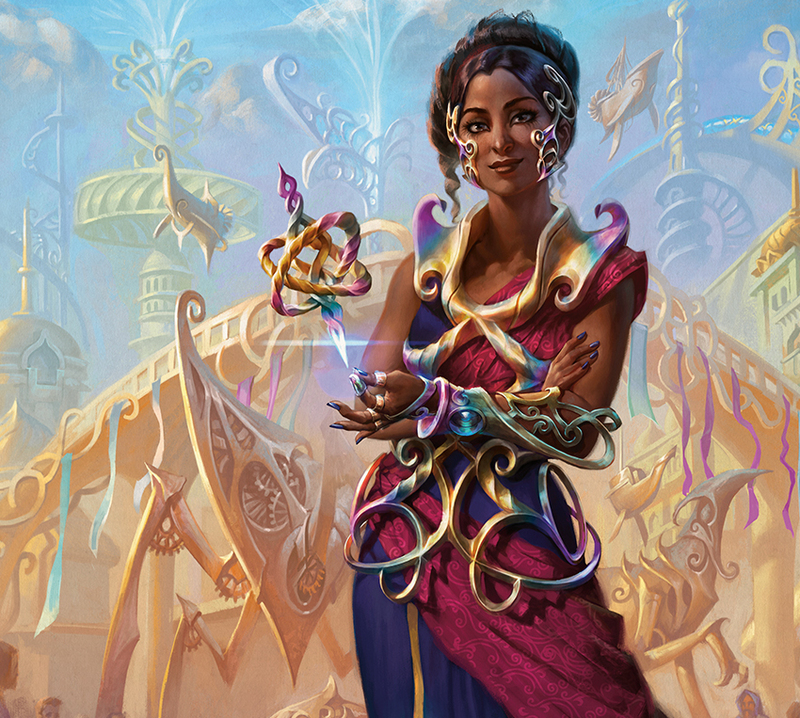 The bright young inventor was standing in the middle of the workshop, practically glowing in the elegant web of shimmering colorful metal that was wound elegantly around her arms and waist. She looked like the sun on a cloudy day. "I've been looking all over for you." Saheeli regarded Rashmi and furrowed her brow. "You look terrible. What are you doing back here? You were just called at the arena." Tears welled in Rashmi's eyes; she was helpless to stop them. "What is it?" Saheeli was at her side, one arm wrapped around Rashmi's shoulder. "What happened?" Rashmi shook her head. "It's over. A broken filament, that's all it took. And there are no replacements. Not in the whole city." She let the tears fall. "Oh. Shhh, shhh." Saheeli rubbed Rashmi's back. "Come now. You had a damaged piece of metal and you didn't think to call on me?" Rashmi sniffed. "You?" And then it hit her. "You! You could fix it." Of course Saheeli could. She was a master with metal, working with even the most delicate pieces in her designs; she could fix nearly anything. In Rashmi's panic, the thought of Saheeli hadn't even crossed her mind. Her months-long seclusion had made her all but forget everything and everyone outside of the inquirium. "Well then, give it here." Saheeli held out her hand, impatient. Rashmi fished in her pocket for the broken filament, but she stopped herself before handing it over. "There's no point. I'll have missed my demonstration." "Oh, I wouldn't worry about that," Saheeli smiled conspiratorially. "I know Padeem well enough. I'm sure that if I tell her about this aether condenser of yours, she'll be too curious not to want to take a look at it." "It's like you said, the condenser might not be flashy, but it's the kind of invention that others can build on. Who knows what it might be used for someday." "Actually, I know at least one thing," Rashmi said, unable to contain her excitement. "Saheeli, I did it, we did it. Mitul and I designed a matter transporter, and it works! We moved a vase from one side of the workshop to the other." She paced, pointing to the place the vase had been. "Can you believe it? I don't even know exactly how we did it. The equations seem to indicate that we're working with forces outside the realms of this world. When I look into the aether, I can see it parting to make a pathway, a pathway through infinity. It's brilliant. And it is flashy! It's going to amaze Padeem and the rest of the judges. And it's all thanks to you." She offered the filament to Saheeli. "I'm in your debt, truly." But Saheeli didn't take the filament, didn't so much as move. "What is it?" Rashmi asked. Saheeli dropped her eyes and took a step back. "I'm sorry. I don't want to do this. I don't want to hurt you, my friend. But I can't." "Can't what?" Rashmi was confused. Saheeli shook her head, holding up her hands. "I can't help you." "You said it was an aether condenser." Saheeli seemed to be getting upset. "It was. But then we did this. This is so much better, so much more." "You don't know that. You don't even know how it works. You don't know the possible consequences of what you've designed. It's too dangerous." Rashmi could barely make sense of what Saheeli was saying. "Of course there are dangers, but we'll run more trials, we'll iterate on it. That's exactly why we need to win the Inventors' Fair. I need the support of the Consulate so we can perfect the design. We're on the very cusp of something here, something amazing that's going to change the world." "Did you ever consider that perhaps there are changes the world doesn't need?" Saheeli snapped. She brushed past Rashmi and headed for the door. "Where are you going?" Rashmi called, her mind reeling, struggling to comprehend what was happening. "I don't want to hurt you," Saheeli said again as she went. "But I can't help you." "Wait." For the second time that day, panic gripped Rashmi. "Saheeli, please. I don't understand. I need your help." She hurried after her friend and grabbed her arm. "Please." Saheeli turned, her cheeks reddened and her eyes hard. "I said, I can't help you. Maybe you're too close to see it, but what you've made here isn't something that should be made." Rashmi stared at her friend in shock. Her confusion turned to anger. "I thought you believed in innovation without bounds. I thought you wanted to see remarkable things happen. I thought you wanted to help make remarkable things happen." "Not this." Saheeli pulled her arm free. "I have to go." She walked down the stairs. Rashmi's anger boiled over. "Then, what? You only believe in innovation when it's things you make? Only when you get all the attention?" "You live your life in the spotlight, Saheeli. Well, it's my turn now. Are you jealous? Are you worried that your invention isn't going to be the shiniest thing at the Fair?" Saheeli's hands balled into fists, but she didn't turn, didn't slow. Rashmi watched the woman she thought was her friend walk away when she needed her most. Saheeli had been automaton dueling with the renegades all through the night. It hadn't helped. 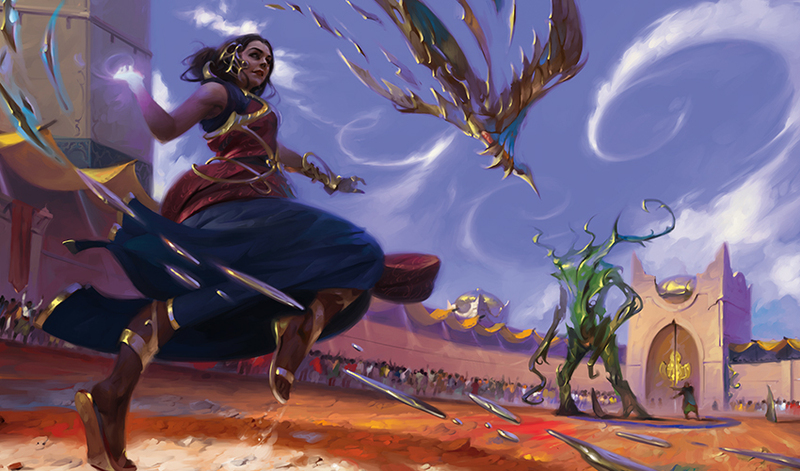 She had come directly to the Fair's main arena—the location for judging during the day, quicksmithing duels by night—after leaving Rashmi's inquirium. Luckily there were plenty of inventors eager to test their creations, because she couldn't wait another moment to sink her automaton's claws into something that she could shatter. Since her first match, she had pounded through no less than two dozen metallic creations. Many of the remains were still being cleared out of the arena. Now as the sun was rising, she was controlling one of her favorite designs, a streamlined bird, which was set to face off against a brutish green automaton. In her opinion, the towering invention on the other side of the arena looked a bit like one of the giants that occasionally migrated through the city. All the more reason to crush it. "Let the battle begin!" the announcer called down from above. 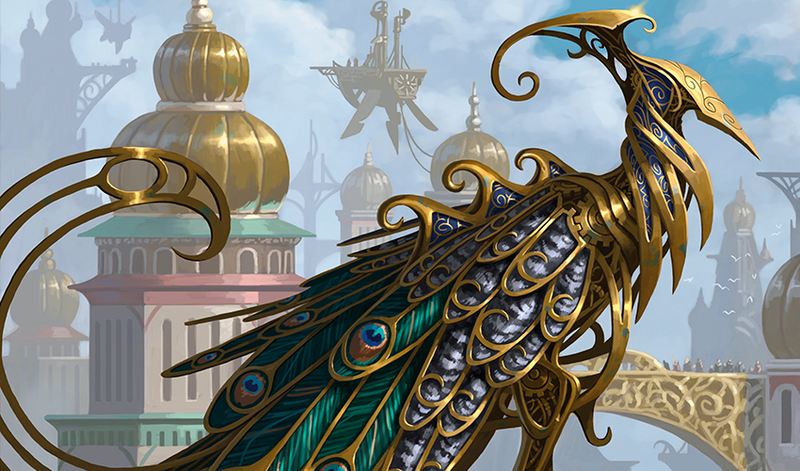 The crowd in the stands cheered as Saheeli launched her bird in an attack, aiming for the giant automaton's neck. It hit! A perfect strike. Whistles and hoots resounded as the brute staggered. One more direct hit like that and she would topple it. She grunted in annoyance. This wasn't working. If only one of these inventors would make something that would actually challenge her, something that would take her mind off everything else. She had come here for a distraction, but for the whole of the night all she had managed to think about was the matter transporter, Rashmi's face, and her biting words. Saheeli looped the bird around for a second go. How dare Rashmi accuse her of being jealous? Envy had been the furthest thing from her mind when her friend had told her about the matter transporter. How dare she? Saheeli sent the bird in for another attack to the neck—but this time the brute blocked. A protrusion of sorts had grown up out of the weak point. Not bad, she thought, silently commended her fellow inventor for the foresight he had put into the design. But she already knew how to circumvent it. She pulled her bird out of its dive and sent it careening upward to gain momentum for a third strike. She had done the right thing, the only thing she could do. She had a responsibility being a Planeswalker, knowing what she knew about the Blind Eternities. There was no question in her mind that Rashmi's device had potential far beyond what the elf realized. And that wasn't safe, not for Rashmi, and not for anyone else on Kaladesh. She had done the right thing. With an echoing caw, Saheeli's bird dove in from behind and drove its beak into the back of the giant automaton's neck. The crowd gasped, rising to its feet. The brute swayed like a tall aether spire in a squall, but it didn't fall. Fine. Another blow then. Saheeli pulled the bird out and wound it up for a final strike. Rashmi had admitted it herself; she didn't understand her equation. She was tearing holes in space without considering the consequences. It was to Saheeli to protect her, to safeguard this world, even if that meant walking away from her friend. She sent the bird hurtling forward, dodging the swatting, flailing green arms, and slammed it, head first, into the automaton's chest. With a long, low groan, the giant plummeted to the ground, landing on its back with a resounding crash. The crowd cheered. "That's another point for Inventor Saheeli!" The announcer boomed. "Which puts her at a perfect twenty-five for the night!" More cheers. Saheeli took a bow, but she was already searching the wings for her next opponent. "And it looks like that's it for today, fellow battle fans. The Fair will be opening its gates soon and we don't want to be caught squatting in their main arena. I, for one, don't want to see the look on Inspector Baan's face if he finds out we were in here." The applause died down, and there was a collective shuffling of feet and stretching as stiff but invigorated fans made their way to the exits. "Thanks for joining us," the announcer said. "Remember to look down to find out where tonight's battle will be." That was an allusion to the secret renegade code that was used to pass information about automaton battles and the like. Saheeli could easily find out where to go after dark, but she didn't want to wait a whole day. What was she supposed to do until tonight? "Oh, come on!" she called from the center of the arena. "We can squeeze in one more. Who's next?" She glanced around, but no one paid her any mind. The other competitors were clearing out as quickly as they could. The arena was already almost empty. "Cowards," she mumbled under her breath. If it was possible, she felt more frustrated than she had before she had arrived. This was the first time that a good round of automaton battles hadn't cleared her head. Annoyed, she stormed out of the nearest exit. The crowd was filling the fairgrounds fast. The gates must have already opened. Saheeli wasn't in the mood for crowds. She wasn't in the mood for anything but another battle. Maybe she could find something at Gonti's. She skirted the busiest thoroughfare and wound her way toward the main gate. She had done the right thing. Hadn't she? The matter transporter was too dangerous. Wasn't it? "It was," she said to herself. "It is." "That's her!" a small voice sounded from Saheeli's left. Saheeli cringed and ducked simultaneously. She recognized the tenor of bubbling delight, and she knew exactly what would happen next if she didn't take evasive action. A quick pivot and she was headed the other way, but two steps later she was blocked by a cordon. "Over there!" The same voice rose above the din of the gathering throng. Saheeli spun around only to find another cordon. She turned the corner and cursed; more cordons, they were everywhere. "Excuse me. Excuse me." Someone tapped her shoulder. 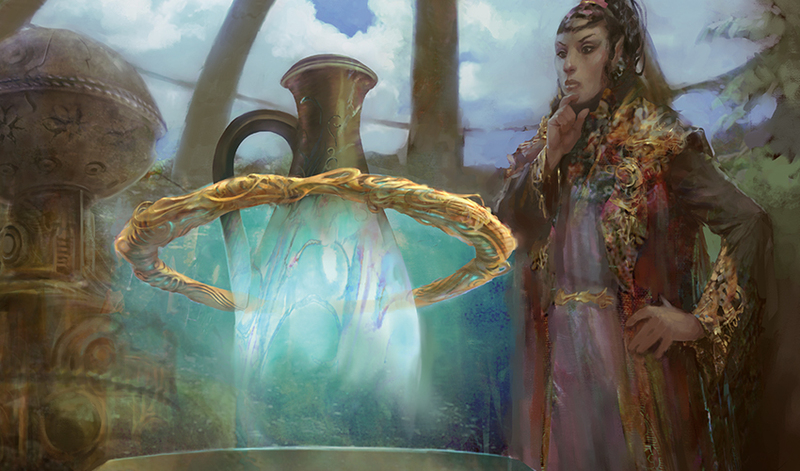 Saheeli inhaled a long breath, attempting to arrange her features into something that could least pass for non-murderous. She turned. "Yes." It was a dwarf dressed in a bright blue skirt and vest, holding the hand of an even younger dwarf who was wearing a set of goggles. "My daughter says that you're Saheeli," the older dwarf said. "Saheeli Rai, famous inventor, brilliant metalsmith, and most renowned luminary of our time," the younger dwarf rattled off the accolades. Her mother flushed. "Yes, well let's find out if it's her first." "It is!" The young dwarf beamed, pointing to a picture of Saheeli in her Inventors' Fair autograph booklet. She read from the page, "'Best known for her unparalleled ability to create lifelike replicas of any creature or construct she sees.' Which is really cool." Her eyes widened to near popping as she gazed at Saheeli. "I'm going to be an inventor just like you someday." The woman who had been trying to hush her daughter finally succeeded. "I'm sorry," she said. "Zara is just so excited to be here. She's been talking about the Fair nonstop for months. Would you mind terribly signing an autograph for her?" The young dwarf held up her booklet open to the page with Saheeli's picture. Saheeli sighed; she couldn't say no. She took the pen. "You can sign next to your quote," the young dwarf said. "It's my favorite of all the quotes." Saheeli scanned the page, finding the quote, and scribbled her name. But her scrawl fell away halfway through as she read her own words. There are times for regulations and rules, but this era of innovation is not one of them. We have to push forward without fear. We have to create without bounds. It's our duty as inventors to make the most remarkable things we can make, to help each other achieve the extraordinary, to change the world. "Well, isn't that something to have shoved in your face?" "Excuse me?" the dwarf said. "Oh," Saheeli blinked; she had forgotten where she was for a moment. "I'm sorry. I was just—here you go." She handed back the young dwarf's autograph booklet. "Thank you." The young dwarf beamed. "Thank you so much!" Saheeli barely heard her. Her feet were carrying her away with purpose; she knew exactly where they were taking her. Hopefully she wasn't too late. Saheeli had never seen a building look forlorn before, but the inquirium did. The antenna seemed to droop and the section that resembled a beetle's head had sagged to rest on the two front legs. Saheeli climbed the steps, steeling herself to knock on the door. She went over in her mind what she would say, how she would say it. She wasn't good with apologies, and in truth, she wasn't yet convinced that she should have to apologize, but something needed to be said—something had to be done—before it was too late. She knocked. Footsteps on the other side told her someone was coming. The door opened and she saw the blue of Mitul's face. "Mitul. I need to talk to Ra—" Mitul slammed the door in her face. "All right." Saheeli glowered. "That was fair." She smoothed her skirts. Gritting her teeth against the urge to storm down the stairs, she knocked again. "Fair, but childish." She raised her voice on the last word, knocking harder. "Come on. Let me in! I'm not going to stand here forever." More footsteps. It was Rashmi who opened the door this time. The elf looked worse than before. Red puffy rings lined her eyes, and dirt and sweat had collected on her face and arms. The last of Saheeli's umbrage melted away. She couldn't bear to see her friend this way. She longed to embrace her, to care for her, but she held back. There was something she had to say first. "I need to explain why I didn't help you." Rashmi refused to meet her eyes. "I was scared. Unsure. What you're doing is dangerous, and—"
"I've heard all this, Saheeli." Rashmi stood straighter. "If you came to lecture me again, please leave." Rashmi made to close the door, but Saheeli swooped in to hold it open. "You didn't let me finish." She inserted herself between the door and frame. "It is dangerous, yes. But," she continued over Rashmi's nearly audible eye-roll, "it's also exciting. Thrilling, even. It has the chance to change the world...for the better." Rashmi let up slightly on the door. "If anyone can make the next breakthrough in aetherology, it's you. And I want to be there to see it. I want to help." Saheeli held up a perfectly formed filament, which she had woven out of the sturdiest metal she could conjure. "For you," she said. "Padeem promised me she would give you an audience if it works." Rashmi stared at her, then her eyes slowly shifted to the filament. "Well? What are you waiting for?" Saheeli said. "Don't you have to run a trial or something?" Rashmi called Mitul, and together the two inventors operated on the golden ring as though it was the most important patient they ever had. Saheeli watched silently from the corner of the workshop as Rashmi reverently carried a vase to the table in the middle of the room and set it in the center of the ring. Mitul nodded. "Test subject number one ready," he said. Rashmi flicked a filigree switch, and the transporter ring whirred to life. Saheeli tensed, holding her breath. She couldn't look, but she couldn't bear to look away. She settled for watching out of the corner of her eye. "Trial start time captured," Mitul said. "Initial aether measurements recorded." The ring floated up from the table, and as it did, the vase flickered away. A moment later it appeared on the other side of the room. Saheeli stared, her mouth gaping in wonder. Her friend had done the impossible. A device now existed that could transport matter through space. Saheeli could only hope that she had done the right thing. As they were carried up to the top floor of the judges' apartments, Rashmi gazed out the glass wall of the lift platform. The sun was setting on Ghirapur and the bustle of the day had faded into the quiet strains of evening. A loose stream of aether gently wound itself through the spiraling domes atop the tallest buildings. A low flying crane skimmed the shimmering waters of the canal below. As she watched the city tuck itself in for the night, a calm settled over Rashmi, one she hadn't felt in a long time. She held the golden transporter ring at her side. It seemed impossible that it all should end here, with a private audience with the Enlightened Keeper Padeem. Sometimes the Great Conduit worked patterns that even Rashmi could not interpret. For all the time she had devoted to studying the flow of aether, all the work she had invested in an attempt to demystify its influence over life, she still found that these kinds of moments were the moments she most treasured: when life surprised her, when people amazed her. "How did you do it?" she asked Saheeli. "How did you get Padeem to agree?" A devious smile spread across Saheeli's face as the lift's doors breathed open. "A front-row seat at the underground artificer duel next month." Rashmi nearly tripped stepping off the platform. "The consul Padeem? Watches duels?" "Of course she does." Saheeli laughed. "Do you care to fill our friend in, Mitul?" "It's something that not many people know," Mitul said. "No one really expects it of a vedalken, but we can be quite quick on our feet when it comes to it, which makes us excellent duelists." "You're saying Padeem was an underground quicksmith?" Rashmi gaped. "The best of her time," Saheeli said. "She could probably still win the night." "Do—do you duel?" Rashmi asked Mitul. "Oh, well, you know...I dabble." Mitul suddenly seemed very distracted by the doors that parted to let them into a small lobby. He hurried inside. Rashmi studied her colleague in a new light. He did look rather nimble, and she could only imagine that his mastery of geometric calculation would serve to give him the advantage in a tactical battle situation. The day was not finished with its surprises yet, it seemed. "Inventors Rashmi and Mitul to see the esteemed judge Padeem," Saheeli said to an official-looking Consulate functionary standing behind a tall desk. "One moment." The functionary slipped through a sliding door, leaving the three of them in the lobby to wait. Saheeli turned to Rashmi, an earnest look in her wide eyes. "I would say good luck, but you don't need it." "That's thanks to you." Rashmi bowed her head to Saheeli. "Thank you. For all you have done. Endless thanks." Saheeli shrugged. "It probably could have been handled better. I—I'm sorry." She glanced furtively up at Rashmi from under her eyelashes. "Friends?" "Always." Rashmi drew Saheeli into an embrace. Saheeli squeezed her arm. "Now, go show that dueling vedalken the invention that's about to change the world." "Right." Rashmi clutched her transporter tightly as the sliding door opened and the functionary came back through. "The consul will see you now." Rashmi looked to Mitul. "Are you ready?" He nodded, holding up the vase. "I am prepared." They followed the functionary through the doors. The hallway led to a small chamber where Padeem reclined in an overstuffed chair. Rashmi couldn't look at her without seeing the daring artificer duelist of apparent legend. The thought made her smile. "Inventors Rashmi and Mitul, the consul," the functionary said. "You may begin." The functionary extended his arm out to a table that had been set before Padeem, for the purposes of the demonstration, no doubt. Mitul approached and set the vase on the table, careful to center it perfectly. After he had stepped back, Rashmi moved forward, lifted the transporter ring, and slid it over the top of the vase to rest on the tabletop. Finding herself not quite ready to begin, she exhaled a long steady breath and looked into the Conduit. At first she thought it was gone, but then she understood that she was standing within it, its light all around her. This was the moment she had been chasing for so long. Now that she was here, she realized that she didn't know what would come next. All she knew was that after this moment there would be no turning back. Once they showed Padeem what they had done, the world would never be the same. Perhaps that was enough. 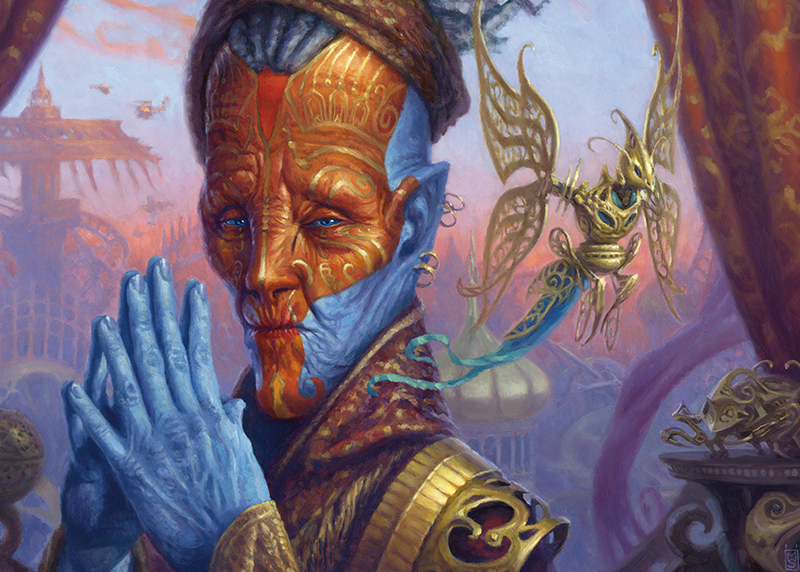 Rashmi took a step back and shifted her gaze to the vedalken judge. Padeem rested her chin on the tips of her fingers. "All right, Inventor Rashmi, impress me."